At York Muay Thai, the quality of the education is our main focus. We teach more than kick, punch, elbow and knee because Muay Thai is a lifestyle . We provide history, language, culture, strategy, philosophy and much more. In order to deliver those elements we require qualified instructors. All of our curriculum has been influenced and developed by Ajahn Suchart Yodkerepauprai from Siam No.1. Ajahn is the Father of Muay Thai in Canada and has been building Muay Thai in Ontario and Canada for over thirty years. Every Instructor we have at York Muay Thai has gone through ALL the relevant testing and requirements (Blue Shorts/Seminars) from Ajahn. All of our staff at York Muay Thai are all CPR/First Aid Certified. Only people who are qualified of the levels, Poo Choi Kru, Kru and Kru Yai from Ajahn are identified as such. Born and raised in the mountains of Northern Thailand, in the early 1960s, Ajahn Suchart has a long history with the tradition and art of Muay Thai. Beginning at the early age of nine, Master Suchart competed in Muay Thai in his small village community in Mae Hong Son. 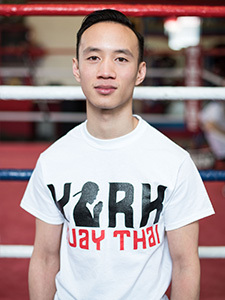 His professional career quickly evolved to competing in Chaing Mai by the age of 14 where he demonstrated great success. In 1982 and 1983 when only in his early 20’s, he became Northern Thailand Champion where he held the title for an unprecedented two years. He has competed in Bangkok’s largest, most highly respected Muay Thai stadiums and has also tested his skills in over a dozen bare knuckle fights throughout the world. Ajahn Suchart’s trust in his skills, knowledge and self have made a him a globally recognized and respected figure in the world of Martial arts. While competing internationally, his love and commitment to Muay Thai turned to University study where he earned a Bachelor degree in Physical Education. He taught in schools in Bangkok for a few years and then combined his passion for teaching and learning with Muay Thai. Ajahn Suchart is one of a few professional Muay Thai Masters who has both an academic university degree, operates a Muay Thai school and trains World class athletes. In 1986, Ajahn Suchart moved to Toronto, Canada. For twenty years, he has lived and built his love for Thailand’s national sport, Muay Thai, in Canada. His dream to bring a beautiful part of Thai culture and history to Canada has been realized as he has taught over 20,000 students and he continues to open his heart and knowledge to those who seek to learn his wisdom. Today, over a dozen of his students have now opened their own Muay Thai gyms throughout the province and are working to promote and honour the cultural sport of Muay Thai. In Canada, he has developed Canadas only Professional Thai boxing World Champion, Clifton Brown who continues to impress the World with his skills. Ajahn Suchart has also trained over 16 amateur national and international champions. Ajahn Suchart has bred Krus, World athletes, young fighters, healthy students and happier people. 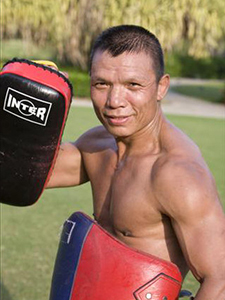 His sights are now set on contributing to the development of Muay Thai as an Olympic sport in 2010. His motto, LOVE, RESPECT and BELIEVE resonates with many who have changed their lives through the philosophies of Muay Thai. Many past and present students attest to Ajahn Suchart’s teachings – not just in Muay Thai – but in life. Youth once troubled, have found a safe place where they experience trust, care and respect and now are leading safer and healthier lives. Young adults build their confidence and face difficult challenges with more grace through Ajahn Sucharts teachings. The school and Ajahn Suchart welcome children as young as 6 years old to adults at any age, to learn and improve their physical health and lives. He welcomes students from all walks of life and his pedagogy transcends issues surrounding class, race, gender, language and religion as he continues to influence them to transform lives through the beautiful art of Muay Thai. He is a leading figure of Muay Thai throughout the world. My experience in martial arts and Muay Thai has been an adventurous one. I began with Boxing, Kali Escrima, Jeet Kune Do, and Savate. However, once I began Muay Thai, I instantly fell in love and decided that this was the art for me. I had the pleasure of training with many talented people across the GTA and eventually made Siam No.1 (Ajahn Suchart) my home. Like most people, I had no intention of competing. I enjoyed all the other benefits such as: discipline, physical fitness, and fun . Eventually, training continuously led me to fight. I competed in my first Muay Thai fight in 2001. I loved the energy I felt being in the ring. I had never done anything like that before. Ten years ago there were not many women competing in Ontario let alone North America so fights were very hard to come by. In 2004 I decided I wanted to go full force with Muay Thai. With Ajahn’s approval, I headed to Thailand. While in Thailand I competed a few times and trained in various camps. Shortly after I returned, I decided to begin a professional career. In 2005 I earned myself the IKKC Professional Women’s Flyweight Championship. In 2006 I suffered an injury during one of my fights and was forced to take time off training and fighting. It was at this time where I was offered a position at York University teaching a Muay Thai program. I also began teaching at The Kombat Arts Training Academy and Xtreme Couture. The York Univeristy program grew so large over three years that I felt it was time to provide these young dedicated martial artists a place they can call home. Thus, York Muay Thai was born. My mission to each and every student is to help them develop as students, martial artists and as people. I pledge to support each and every student and also to support and help grow Muay Thai in Ontario and Canada. 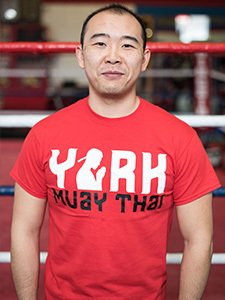 Kru Cam Tang Poy began training Muay Thai in 2007 under Kru Yai Jenypher Lanthier (Head instructor of York Muay Thai). 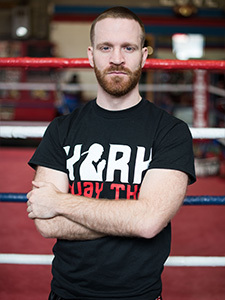 Since then, he has competed in over a dozen bouts as an amateur fighter both in Canada and the United States, and now focuses on developing the students and competitive athletes at York Muay Thai. 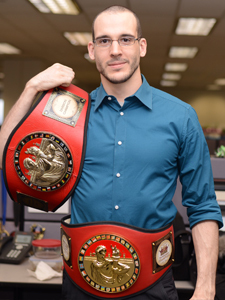 He is also the director of the Children’s Muay Thai program. 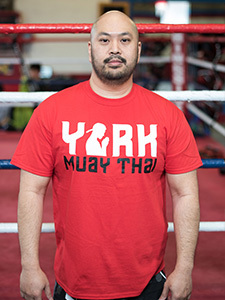 In 2010 and 2011, Kru Cam taught the Muay Thai program at York University’s Tait McKenzie Fitness Center, as well as Boot Camp classes at its Vanier College, whenever he wasn’t training at YMT. These experiences helped him find his path. In 2012, he became an Ontario Certified Teacher, completing his education at the University of Toronto. Today, he has the privilege of living his passions 24/7: Working in Toronto schools during the day and training Muay Thai students by night has kept him busy, pushing him to continually grow and expand. He loves every moment of it. 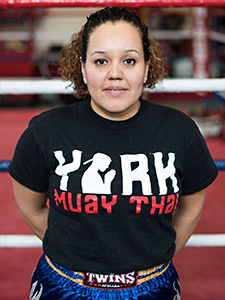 I began training in Muay Thai in 2005 with my cousin at a gym in Woodbridge, later on in 2008 I joined Xtreme Couture in Toronto and this is where I met Kru Yai Jenypher Lanthier and in 2010 I joined her at York Muay Thai and I have not looked back. To me Muay Thai is beyond a martial art, it is a way of life. It balances me and brings me focus in everything I do. Muay Thai has given me so much that now I want to give back and this is why I wanted to teach and help others. 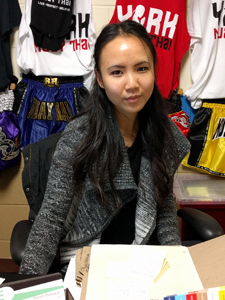 Being an Assistant Instructor (Poo Choi Kru) means a lot to me, and I was an honoured to be chosen to help others and begin to teach other about Muay Thai. I started Muay Thai with Ajahn Suchart at Siam No. 1. when I was 17. I trained for many years before I started teaching there. I have since been invited to teach at other martial art schools which has given me good experience passing on knowledge to different demographics with different backgrounds. I have developed a passion for it. I have a strong respect for the art and embrace a martial art mentality. I have seen many transformations in myself and others and that progress is what keeps me motivated to continue to pass on Muay Thai to the next generations. 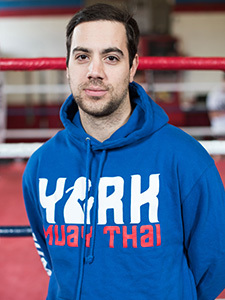 I began training Muay Thai with Kru Yai Jenypher at York University in the fall of 2009, when I moved to Toronto. I knew of her by reputation and began training with her because she was highly recommended to me. I had previously competed in amateur boxing, Brazilian Jiu Jitsu and Karate, and wanted to continue my journey through the martial arts with Muay Thai. Prior to training with Kru Jenypher, I had very little competitive success in any sport or martial art. However, thanks to her tireless coaching, guidance, and mentoring, I have grown as both a fighter and as a martial artist. In the Summer of 2011, I competed at the TBA-SA Muay Thai Classic in Des Moines, Iowa, and won the Middleweight B-Class belt, winning 3 fights in 2 days against tough opponents. For the next few years, I competed regularly, traveling to New York, Iowa multiple times, Michigan, and Quebec to represent YMT. In the summer of 2015, and with the establishment of Muay Thai Ontario, I was finally able to compete in my home town of Toronto at Woodbine Racetrack in what would be my 22nd time in the ring. During this time, I also focused on coaching, both helping to sharpen the weapons of the younger fighters and regularly teaching introduction classes, allowing me the privilege of introducing first time students to the sport that I love. However, it is important for me to realize that these were not my lone accomplishments. None of this would have been possible without the consistent coaching, hard training and guidance from Kru Jenypher, and her team of highly qualified and accomplished assistant coaches. I am humbled to be included as one of her Poo Choi Kru’s and hope that my contribution to YMT will one day match how they have contributed to my growth as a person. Until then, I will work to take the authentic brand of traditional Muay Thai that Kru Jenypher learned from Ajahn Suchart, and help spread it to the students of York Muay Thai and anybody else who is eager to learn. Starting her journey in sport and physical training at the age of 14 through track and field and kick-boxing, Natalie discovered her passion for fitness achievement and the science of movement. 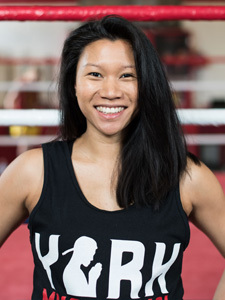 She began her competitive career a couple years later in the sports of Track and Field, Karate followed by Muay Thai which resulted in the discovery of her life passion of guiding others to achievement through movement and fitness. This led to her post-secondary education at George Brown College in the intensive, hands-on Fitness and Lifestyle Management Program. During this time and over the following years, Natalie trained athletes, provided professional support to a variety of clientele and taught Muay Thai. She has worked in several roles including Personal Trainer at a high-end boutique gym, Assistant Strength Conditioning Specialist at York University and Fitness and Sport Program Coordinator also at York University. 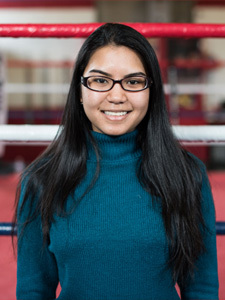 Through her 12yr amateur and professional career in Muay Thai and transition to amateur Boxing, she gained significant and direct experience training as an athlete, competing internationally and teaching others in the art. Natalie has spent almost two decades in the field training clients, teaching a range of fitness classes, guiding other trainers and developing fighters; she has gained a wealth of knowledge and experience that shapes her as a unique and effective coach today. Natalie’s mission is to inspire communities of people to embrace life-long practices towards holistic health through affordable, client-centered and comprehensive fitness services. She is dedicated to helping others get fit to improve how they feel day-to-day and to help them find the fun and enjoyment in exercise and activity for long-term adoption of an active lifestyle. I have been training Muay Thai since 2012. In that time, I have developed a passion for working with young children and have helped run kids programs at several Muay Thai schools. Having the combined experience​ of training for the ring, and being a full time mother has given me the determination to lead new generations of martial artists. I understand the importance of respect and discipline in a child’s development, and bring these values into my kids classes at York Muay Thai. It is my goal to help your child become the best person they can be, and have fun doing it.